Than to stand in the bar of a pub with no beer"
So sings Slim Dusty in his most well known song. On Easter Saturday we ventured inland to search for the actual titular "Pub With No Beer"; found at the end of a winding drive through the countryside, 30km west of Macksville at Taylors Arm, 20km from Dusty's Kempsey birthplace. We were lured by the website, which promised a gourmet pizza and lunch menu and a full range of tap beers from the onsite Murray's Craft Brewing Co. We didn't get around to booking a brewery tour before we went, but we hoped we could have a quick look out the back while waiting for lunch. Unfortunately, upon arrival we discovered that the pub had recently come under new ownership with Murray's Brewery moving to a new location in Port Stephens. It was almost a case of the pub having no beer, as the range of Murray's beers available, the main reason for our visit, had been steadily dwindling since the change. We had viewed the old website, the new one not even appearing in a Google search for 'pub with no beer'. The food was also not the gourmet feast we were hoping for. Standard pub fare, burgers, fish and chips, schnitzel, steaks etc and not really worth commenting on, but it was tasty, good value and popular with families seeking a relaxed lunch venue. We sat at rustic wooden tables on a wide open balcony in the sunshine and sampled the three beers available on tap. First up was the Whale Ale, a crisp American style wheat beer followed by the 8.8% trippel ale Grand Cru and to finish, the Swinging Arm Dark Ale. We managed to buy the last available bottles of the Nirvana Pale Ale and Pilsner to take home and try another day. There was plenty to see at the pub, vintage posters and Dusty memorabilia as well as a collection of vintage beer cans housed in a historic 1921 church relocated to the site. I doubt we will make the trek again, there are plenty of better pubs closer to home with the same facilities, but we are now definitely planning to head south sometime to try the full range at Murray's new location. 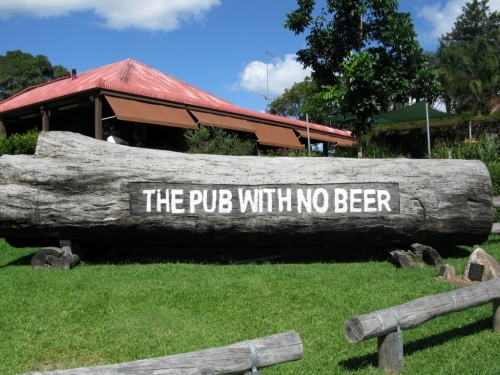 The Pub With No Beer, 4 Main Road, Taylors Arm, NSW 2447. 1 Sounds a fun way to spend a Saturday. Enjoyed a lovely weekend on the central coast with the blogger. She prepares food with skill and enthusiasm. wonderful time and food.